External defibrillators are light weight and portable devices used to deliver therapeutic shock to a patients heart in life-threatening conditions, such as ventricular fibrillation, cardiac arrhythmia, sudden cardiac arrest, and pulseless ventricular tachycardia. The hospital and pre-hospital external defibrillators market is expected to grow at a significant rate during the forecast period, owing to increase in demand for automated defibrillators, surge in prevalence of chronic cardiac diseases, growth in awareness about technological advancements about automated external defibrillators in developing countries. In addition, rise in the geriatric population, and development in healthcare infrastructure further drive the market growth. However, higher cost of external defibrillators, and stringent government regulations for their approval can impede the market growth. The global hospital and pre-hospital external defibrillators market is segmented based on type, end user, and region. According to type, the market is bifurcated into manual external defibrillator and automated external defibrillator. Based on end user, the market is categorized into hospital and pre-hospital. The hospital market is further categorized as general wards, ICU, emergency room, and others. The pre-hospitals market is sub-segmented into EMS, fire department, police, private transport companies, and others. Based on region, the market is studied across North America (U.S., and Canada), Latin America (Brazil and Mexico), Europe (Germany, France, the UK, Italy, Spain, Poland, and rest of Europe), Asia-Pacific (China, Japan, India, Australia, South Korea and rest of Asia-Pacific), and the Middle East and Africa (Saudi Arabia, South Africa, and rest of Middle East and Africa). Based on type, the external defibrillator market is segmented as automated and manual. In terms of volume, the automated external defibrillator segment dominated the global market in 2017 and is expected to maintain this trend throughout the analysis period. Moreover, the automated external defibrillator segment is anticipated to experience rapid growth during the forecast period. Some key factors such as technological advancements in automated external defibrillator, rise in adoption of automated external defibrillators in the developed economies such as North America & Europe, and increase in awareness in developing economies further boost the market growth. Based on end user, the global hospital and pre-hospital external defibrillator market is segmented into hospital and pre-hospital. Moreover, the hospital segment is further classified into general wards, ICU, emergency room (ER), and others. Similarly, the pre-hospital segment is further divided into emergency medical services (EMS), fire departments, police, private transport companies, and others. 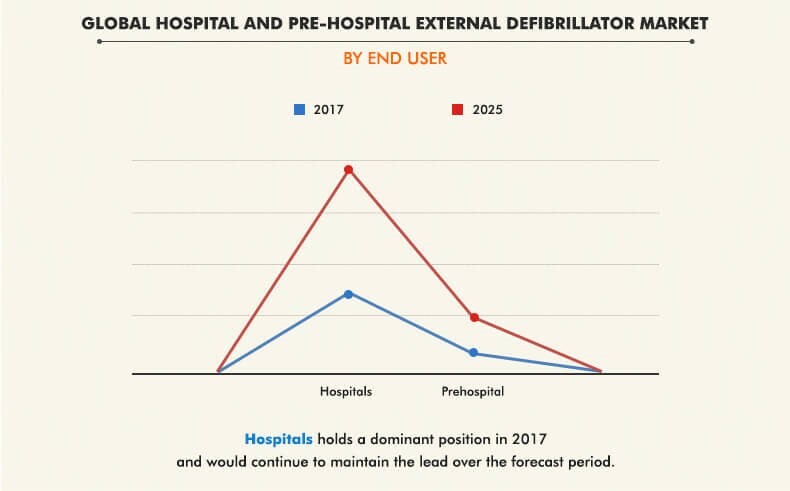 The hospital segment is expected to dominate the global external defibrillator market throughout the forecast period, owing to surge in number of hospitals and higher usage of defibrillators within hospitals. Asia-Pacific offers lucrative opportunities in the defibrillators market and is anticipated to be the fastest-growing market during the forecast period. Its growth is supplemented by the rise in demand for sophisticated defibrillators, large number of healthcare reforms, high prevalence of heart failures, and increased focus of key players on developing technologically advanced cost-effective defibrillators. 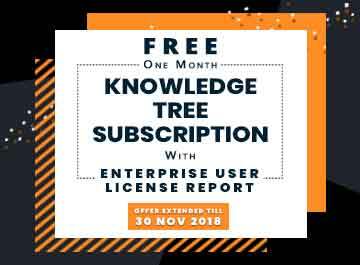 The key players profiled in this report include Asahi Kasei Corporation, Aurora Capital Group. (Cardiac Science Corporation), General electric company, Koninklijke Philips N.V., Mediana Corporation, Shenzhen Mindray Bio-Medical Electronics Co., Ltd., Nihon Kohden Corporation, Progetti srl, Schiller AG, Stryker Corporation. A defibrillator is a medical device capable of carrying out defibrillation by the delivery of an electric shock to the heart. This results in depolarization of heart muscles leading to re-establishment of normal conduction of the heart’s electrical impulse. Defibrillators are highly used in hospitals, specifically in department such as ICUs, emergency rooms (ER), general wards, and others. These are also used by emergency medical services, fire departments, police, private transport, and others before the patient is taken to a hospital. The increase in number of patients with cardiovascular diseases is the major factor that drives the growth of the global hospital and pre-hospital external defibrillator market. Other key factors, such as rise in geriatric population, surge in adoption of external defibrillator, and increase in demand for technologically advanced devices drive the growth of the market. However, limited insurance coverage and high cost of defibrillators are anticipated to impede the market growth during the forecast period. North America is a major shareholder in the global external defibrillators market mainly due to higher prevalence of cardiac disorders, high adoption rate of technologically advanced defibrillators, presence of highly sophisticated healthcare infrastructure, favorable reimbursement framework for defibrillators, and increased patient awareness about the availability of congestive heart failure (CHF) treatment options. However, Asia-Pacific is expected to experience fastest market growth owing to surge in awareness of technologically advanced automated defibrillators and rise in adoption defibrillators within hospitals with development in healthcare infrastructure. "Hospital and Pre-Hospital External Defibrillator Market"